I like that I finished another bag of scraps and made another baby quilt top. But I must be honest and tell you that I'm not crazy about it. Too busy. Wish now I'd used only two prints and some white instead in these disappearing four patch blocks. The one in the top corner is because I cut one side too big. The four patch in the middle just didn't work after that, so I put in a solid. The yellow print flannel behind it will be the back. Measures 32 1/4" square. Going to the neonatal clinic. We've had some winds here and that's a good thing in our 4/10th of an acre. 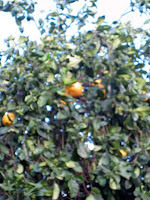 Our picking pole can't reach the remaining pomelos, so the wind is nicely swirling the tree about and having a few fall down. Yippee - fresh fruit for breakfast. Lastly, I'm liking the odd weather we've had - two days over 95 degrees. I should count them as the first days of summer. Friday, it's suppose to go back to 69. What a roller coaster we are on. Do stop by Lee Anne's post of I Like Thursdays. It's fun to read about positive things at least once a week. Your quilt is pretty enough, but I understand what you're saying about busy. Never mind, another bag gone. Well done. I don't think your quilt is too busy. With the solid yellow squares that allows the eye a place to rest. We have had rollercoaster weather here as well - it seems like it is everywhere! Someone whose baby is in the neonatal clinic is going to love your busy, happy quilt! And I'm sure they need that kind of comfort at times. Thumbs up for fruit right off the tree - I'm eating grapefruit from my mom's tree this week and it's so delicious! 95 is a bit warm for me, but at this point, I'd take it. I'm so tired of the wind and the cold here in New England! Your scrappy finish looks great. we've had big wind here too. And very hot weather, around 80 yesterday with the sun beating down. So hot today people are in shorts, and it's supposed to snow tonight, lol. 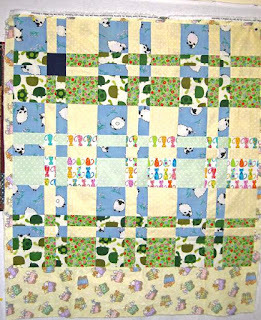 I like that baby quilt, cute and a baby will like all the prints! Have a wonderful day!